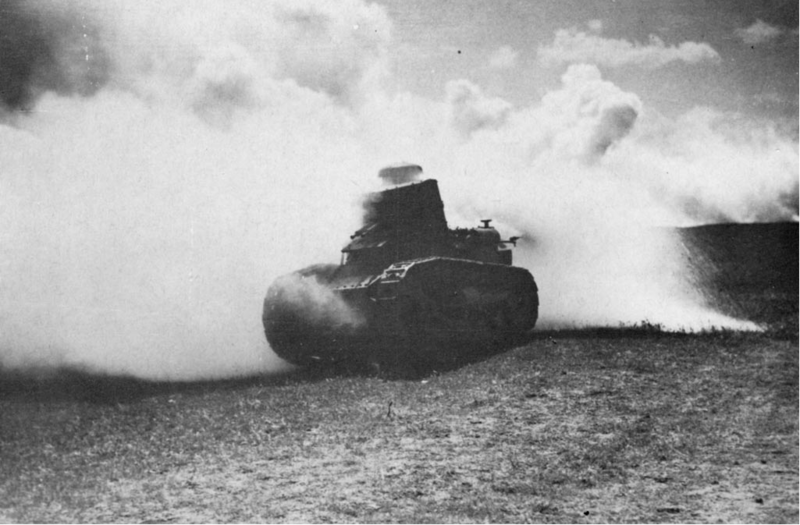 Many nations experimented with smoke generators and smoke screening equipment with their early tanks, such as the British with the Medium Mark C ‘Hornet’. The advantages were obvious, whilst a smoke screen cannot stop bullets, it can screen and prevent infantry, in particular those following a tank, from being seen; it is simply harder to shoot a target you cannot see. The same applies to tanks. If a tank was able to either produce its own smoke screen or be screened by a specially converted vehicle in the platoon, this would be a significant tactical advantage, particularly in attack. Fiat 3000 M.21 registration number ‘R.E.36A’ fitted with smoke generating equipment, circa 1925. Note no armament is fitted. 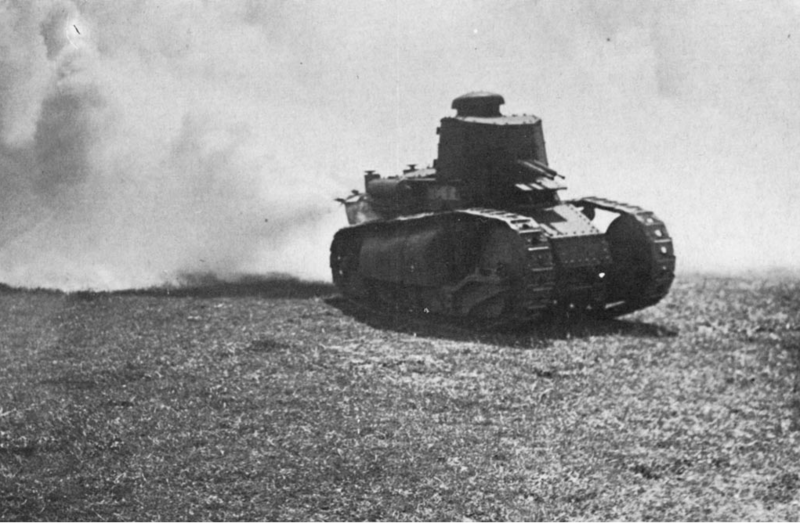 The first experiments in Italy with a tank laid smoke screen were in 1925 during military maneuvers conducted at Canavese, north of Turin. 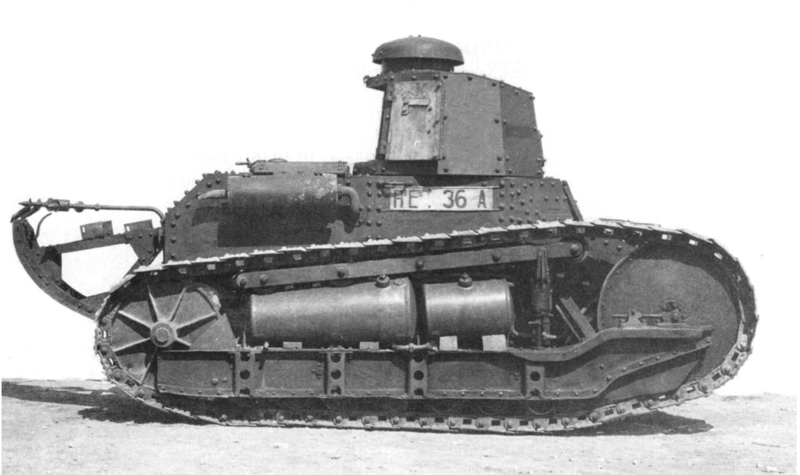 A standard Fiat 3000 Model 1921 tank with registration number ‘RE 36A’ was used and was retrofitted with two cylindrical tanks into the cavity in the right-hand side suspension unit with the leading cylinder being about half the length of the second. One of these two containers held the liquid sulphuric acid and the other (presumably the smaller one) held the compressed gas used as a propellant. The left-side suspension cavity was not used for the experiment, although assuming more smoke was needed, a second set of containers could simply be added there too. 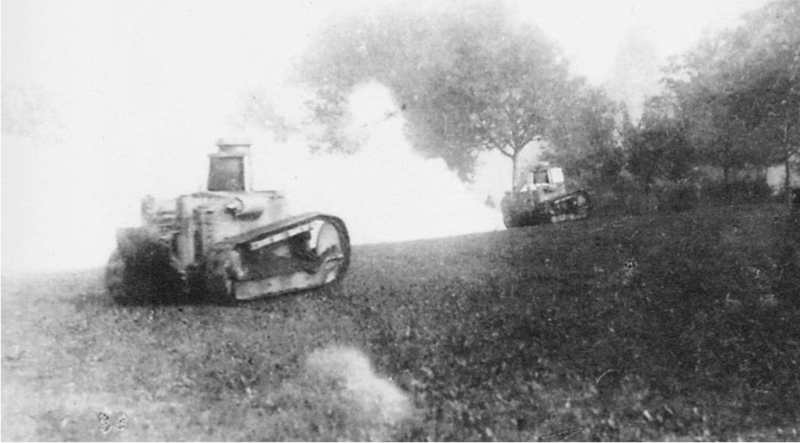 Emitting smoke from the left-hand side during the same 1925 maneuvers suggests at least two vehicles tested this equipment. The large container held a quantity of sulfuric acid which was simply sprayed by means of a nozzle on the back of the tank into the vented exhaust. This is a similar method to that on the Medium Mark C ‘Hornet’ which also used a tank of acid (sulphonic) sprayed into the exhaust. There, it would react with the engine-exhaust gases producing a thick cloud of white smoke. Obviously, the engine would need to be in running order for the system to work, as it was needed to drive the pump. It is not known whether more than one vehicle was prepared in this way or whether these were simply kits which could be added to the tank. 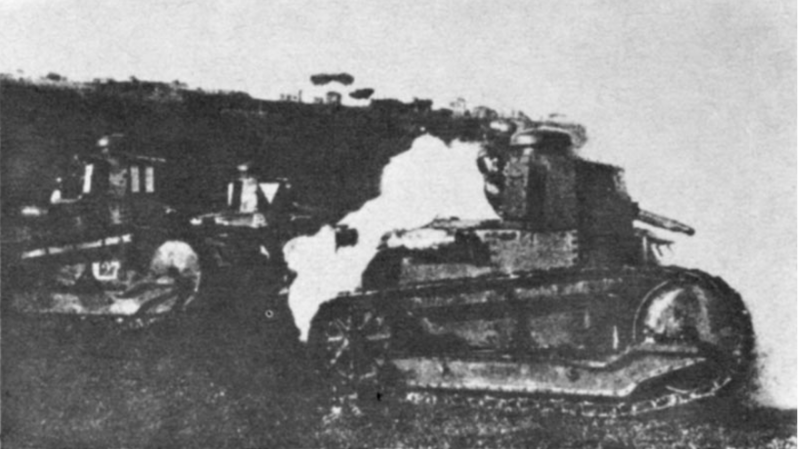 Some photographs seem to show smoke being produced from the left-hand side of the vehicle, suggesting that more than one vehicle was modified in this way. Either way, the system was not put into mass production. Handbook on Italian Military Forces. (1943). US Military Intelligence, Washington D.C. The 1925 version of the Fiat 3000 Nebbiogeno. Illustrated by Bernard “Escodrion” Baker and paid for with funds from our Patreon campaign. The 1935 version of the Fiat 3000 Nebbiogeno. Illustrated by Bernard “Escodrion” Baker and paid for with funds from our Patreon campaign. With the smoke generators demonstrated in 1925 not having entered mass production, a further attempt was made in 1935 perhaps building on the experience which had gone into the production of a manual on Smoke Training produced in 1933. This time it was for a demonstration of chemical weapons in Rome and involved large numbers of troops simulating fighting in a chemical warfare environment. This experiment also used the Fiat 3000 Model 1921 and, once again, the liquid containers were placed into the cavity within the suspension on the sides. Photographic evidence clearly shows that each side was fitted with a single longitudinal container running along the suspension support member. The container had a usual shape with a curved outer top edge. The container also projected substantially past the width of the track. The volume of the containers is not known, but the projection system was essentially the same using a nozzle on the back end to inject sulphuric acid into the exhaust to produce smoke. 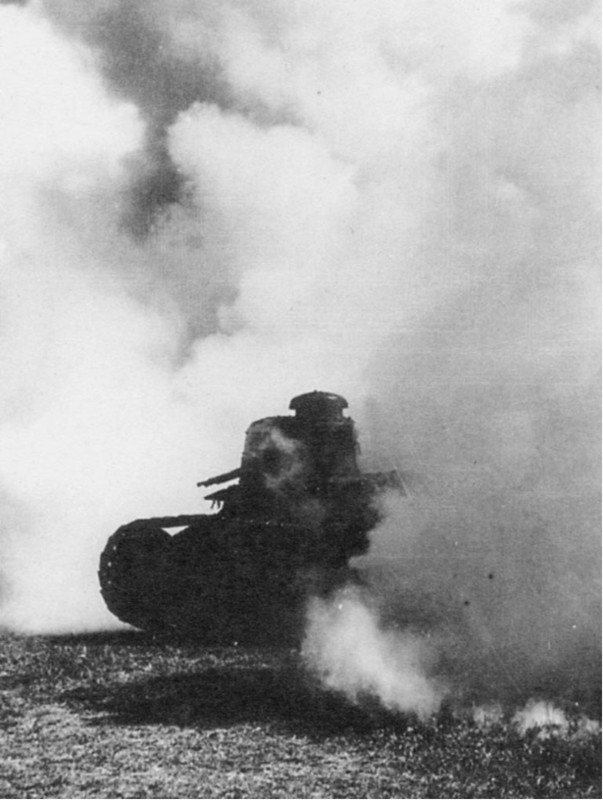 Fiat 3000 M.21 producing a smoke screen during manoeuvres in Rome 1935. By 1935, it was obvious to the Italian army that the Fiat 3000 was obsolete anyway. Perhaps because of this, the smoke generating modifications on the Fiat 3000 did not see further development. Instead, the Italian army relied upon artillery for smoke barrages and on portable smoke producing equipment. Candles for the troops (Italian: candelotto fumogeno and candela fumogena), portable smoke generators (cloramma barellato) carried on a hand-barrow, a mobile generator (chloramma carrellato) on a handcart, or, for mobile screen, from a 4 or 6 wheeled (Italian: autodovunque yperite 6 and autodovunque yperite) trucks such as the Dovunque which had been designed for use in delivering mustard gas. When used for carrying smoke equipment, the trucks were simply ‘autocarretta nube’. The truck-mounted system, when used for smoke instead of mustard gas, carried two 250 litre (500 litres total) or a single 250 litre drum of chlorosulphonic acid for the 6 and 4 wheeled versions respectively. It could produce smoke for up to 100 and 60 minutes respectively, significantly more than the small system tried on the Fiat 3000. For tanks though, the problem of a forward screen was not going to be solved by candles or by truck-mounted sprayers. Instead, it was a role taken over by the sturdy CV.3 light tank which was able to be equipped with a trailer (Italian: carro veloce con rimorchio). The trailer contained 240 litres of sulphonic acid (although the same system could also be used for spraying mustard gas with a compressed air cylinder) in two cylinders and could produce a smoke screen for up to 17 minutes. The cylinders took 30 minutes to refill. Using this information it is possible to speculate that the Nebbiogeno modifications would only have been able to produce smoke for 10-15 minutes given the very small size of the containers. This would not have been very useful considering the anemic speed of the Fiat 3000 in an attack, running out of smoke before actually making contact with an enemy. It is not known how many of the 1935 version were produced but, just like the 1925 modification, it did not enter mass production. 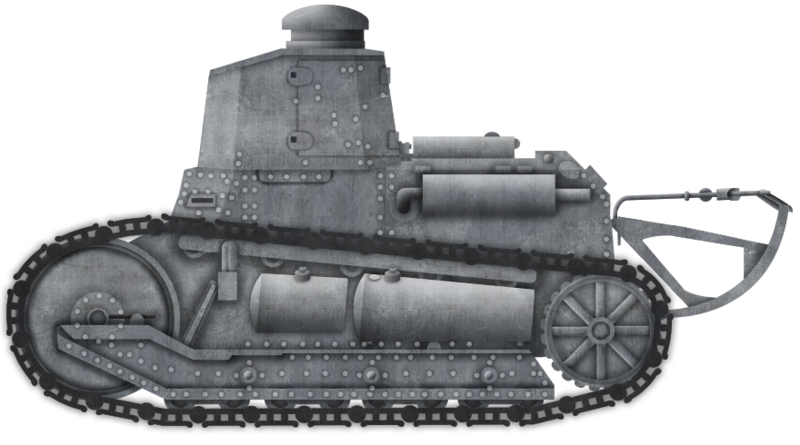 At least two of the 1925 version tanks were made and both would be able to conduct their normal tank roles with this equipment. The 1935 vehicle shows that it still retained its twin 6.5mm SIA machine-guns, although it is unclear what weapons were used on the 1925 version, as the best available image of it shows it with the weapons dismounted from the tank.